Not to be confused with bàn miàn (拌麵), which is typically called lo mein in English. Banmian (板麵) is a popular noodle dish, consisting of handmade noodles served in soup. The name banmian (board/block noodle) came from the Hakka's method of cutting the noodle into straight strands using a wooden block as ruler. In Hakka, some might call it Man-Foon-Char-Guo (麵粉茶粿) or Dao-Ma-Chet (刀嬤切). In Hokkien, it was called Mee-Hoon-Kueh (麵粉粿; lit. "wheat snack") but what can be found at hawker stalls is generally called banmian. The current style is a mix between the traditional methods of Hakka and Hokkien. The Hakka initially made the noodle by shaving off a dough, whilst the Hokkien would roll the dough into a flat piece then hand-tear into bite-size. Banmian is a culinary dish that is popular in China, Malaysia, Singapore and Taiwan. It consists of egg noodles served in a flavorful soup, often with some type of meat or fish, vegetables and various spices. The meal is considered one of the healthier food choices and can be found for sale by restaurants, street vendors and food stalls in the region. The base of the entire meal is a soup, so there are numerous variations in ingredients, stocks and noodle shapes. In many instances, the completed soup is topped with an egg that is cooked in the hot liquid above the noodles. The base of the soup can be water but is more commonly a type of fish stock. Normal fish stock can be used, but anchovy stock is a common choice. Various ingredients, such as onions, garlic, ginger and bean paste, also can be added to the stock to provide more flavor, although some preparations are so simple that nothing more than plain stock is used. In Malaysia, you can also try the dried version with soup served separately. 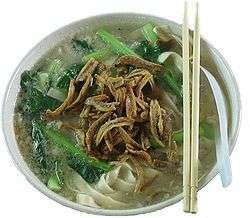 Two common ingredients that are often found across different versions of banmian are mushrooms and anchovies. The exact type of each might vary, but they are generally added to the stock base. The mushrooms can be dried and are reconstituted in the broth, while the anchovies could be fried until crispy and then served on top of the soup. The anchovies also can be added to the stock for flavor and allowed to break down as it cooks. Once the base stock is completed, nearly anything can be added to complete the banmian. This includes vegetables such as green onions, spinach, cabbage and bamboo shoots. Some vinegar is usually added, occasionally with sugar to balance the flavor. Restaurants may offer minced pork that has been fried or chunks of white fish to act as a protein-rich addition to the soup. Finally, an egg is cracked into the hot broth and allowed to cook until the whites are set and the yolk is warmed through. Wikimedia Commons has media related to Ban mian.